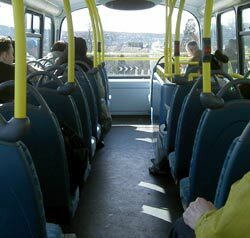 I travel on buses and trains daily for my work during the week and shopping or leisure weekends. I have done this for a fair number of years and have never seen anything close to what I witnessed yesterday. I boarded the bus as normal and then two stops along the road a young lad tried to get on the bus with his puppy dog (staff/lab cross) apparently. He had come from another town by bus and wanted to make his return journey home but was refused entry by the bus driver. He told the driver he had travelled on three buses to get where he was and now wanted to go back home. If the other three other drivers had allowed him and the dog to travel, why couldn't he get on this bus? The bus wasn't at all crowded, there were probably only about 12 people on it at most, but the driver shouted at the lad "Get off my bus". The lad continued to repeat himself and in the end the driver switched the engine off and we just sat there. The young man was probably about 16-17 year-old, but in all honesty didn't raise his voice or show any kind of aggression whatsoever. Meanwhile, the driver just ignored him and sat there. People on the bus were getting agitated by now and started to shout abuse at the driver and the lad. One man told the lad to get off or he would put him off, to which he replied, "Whats the problem, three other buses allowed me to travel?" We were stationary for around 25 minutes until another bus on the same route pulled in. The young man got off our bus and onto the other bus; no problems with the dog at all and off he went. We still had to sit and wait for the police to arrive. Along with a fellow passenger, I went to the driver and asked if he could cancel the police so that we could be on our merry way and let the police deal with a more deserving case. Was this the right thing for the driver to do in the first place? The dog certainly didn't look like a threat and I could have understood if the puppy had been an adult dog, but it was three months old for goodness sake! At the very least, bus companies should have a clear and consistent policy about dogs on buses. I see some ridiculous comments about dogs causing problems on buses and that people with dogs should walk instead. As far as leaving a mess, unlike people who discard food, cans, bottles and food wrapping all over buses, I've never seen any dog urine or dog defication in a bus. Also bear in mind, London government and TFL are trying to get people to use public transport instead of cars. I live in Central London, have a dog and try to use public transport whenever I can. Yes, where possible I walk to my destination, but often it it too far for my older dog. Most bus drivers are fantastic, but unfortunately I've been harassed by ignorant bus drivers who don't like dogs, don't know anything about dogs, and regardless of the guidelines issued by TFL, don't want to let any dog on "their" bus. Frankly I'm fed up with those drivers saying they are "letting me on... this time"
The situation advised by TfL is just unreal. Whilst I accept the driver has a "professional" interpretation of a situation TfL cannot obviate responsibility to their customers. I have been on all forms of transport with my pet dog. I can assure those who appear to be anti-animal that unlike most children and some adults the behaviour of my pet was excellent, whilst the screaming anti social behaviour of children frightens the elderly and vulnerable. Adults placing feet on seats, whilst my dog always sits on the floor under a seat! Animals do not we or pooh on transport unlike people! Neither do they carry diseases. In fact it is a documented, evidence produced result that a pet has a positive effect, reducing stress, creating feeling of well being. They even encourage pets to visit owners and relatives in Hospital on the ward! So if it is good enough for them it is certainly good enough for TfL, buses, trains and tube. Snakes on buses - Here in London we face the same problem. I'm planning a bus ride party and we were thinking about going out for snakes and other animals. However, I realize I can have my snakes over and we can ride on buses for about 2 hours each if you know how to care for them. Smart drivers waive the extra fare if you bring in enough reptilia. Many drivers here have half price fares on Sundays or Saturdays so that helps a bit. Let's allow Boa-Constrictors on buses. SUrely they will be able to squeeze more space for themselves. collar - of course guide dogs are allowed on buses. Why do u think they aren't? I think it horrific that 'seeing eye' or 'guide' dogs are not allowed on buses. Come on bus drivers, with the way you pull away sharply from the stop, these blind individuals need all the help they can get. Keep the d@mn dogs off the bus. Who needs these beasties on public transport? Buses were meant for humans not animals. If you have an animal walk it to its destination. Buses are city transport for people. People who live in cities should not have dogs at all. There's no room for them. They pooh all over the pavements and parks. I don't want them. Millions don't want their filth. It's cruel anyway to keep them locked up in apartment blocks all day long anyway. Some dogs are dangerous. Many carry dangerous diseases. Time to ban them. First of all, it's a dog, an animal. We seem to have forgotten that somewhere along the line. Maybe inbetween all the cute doggy ads and Hollywood movies we seem to aspire for our pets. It's up to the Driver of that bus if he wants to let that dog on or not,TFL can't legally force drivers to allow dogs on buses for the simple reason that Drivers hold that PROFFESIONAL LICENCE AND THEY ARE IN CHARGE OF THAT VECHILE, WHAT A DRIVER SAYS, GOES!. Dogs poo and piss on bus floors and seats sometimes, especially puppy's. They are a nuisance to guide dogs, and most importantly NOT EVERYONE IS FOND OF YOUR LITTLE BRUNO, TIGER OR HARRY! If that dog poo's or pisses on the bus floor, that bus then has to be take out of service to be cleaned. Grow up and take responsibilty for own pets and don't make it someone else's problem and stop meddling in things you have know understanding about. All you wanted to see was a cute puppy and horrible bus driver. P.s, ever sat on a dog wee soaked bus seat wearing a new suit and an important meeting to attend? Collar, there are so few dogs that assist blind people in comparison with the number of indulged, nuisance pets. I accept that guide dogs for blind people, which are usually well-trained, should be able to accompany a blind person on a bus, but that's as far as it goes. No other dogs should be permitted to travel on public transport. Unfortunately, too many people are blind to the fact that other people do not love their dogs as they do. They cannot understand why their dog's funny and cute habits like jumping on people or having a crafty wee or having their poop-speckled and possibly worm-infested backsides on the seats are not endearing to other bus users.